You, Me and Movies: IT: Chapter 2 gets a 2019 release date! Well, as no surprise to anybody paying attention, "IT" is getting a sequel. This was always the plan, there was always going to be a kids story and an adults story later. That was how the book was written. The book went back and forth between the adult and kid story. If one thing really disappointed me about the film, its that they left out the back and forth between the two stories. The power of memory is so important to the book that I kind of had a hard time with it not being in the new movie. But I want to put an emphasis on the "kind of," I stand by my review. I really liked the movie. 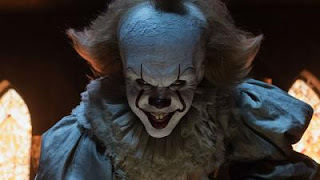 "IT" has been a smash hit at the box office. I think its been a bigger hit than anyone expected it to be. So we are getting the second half to this story. The towering conclusion. The first film had a very small budget, I hope with all the money this first film is raking in that the sequel gets a bigger budget. I hope we see more of It's world. I hope we get a real reference to The Turtle and why he's important. I can't wait for casting and production to start! You have grabbed the audience, now take this thing off the rails like it should! Prepare for more Pennywise and The Losers Club on September 6th 2019!